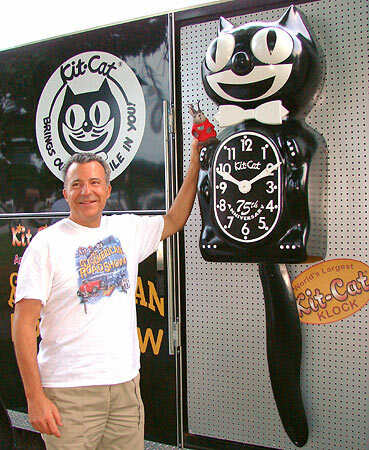 The world's largest Kit-Cat clock (6 ft, 3 in) has been touring the area we happen to be in the the last couple days. One must photograph with the world's largest anything, so Ace Jackalope and I checked it out. 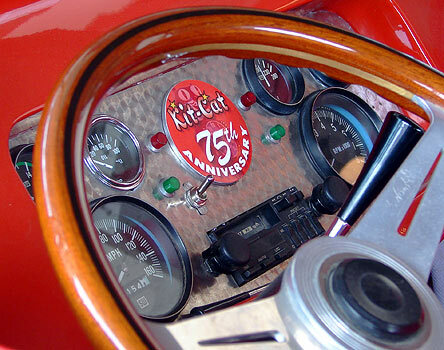 By the way, the manufacturer does sometimes call them Kit-Cat Klocks on their website, with a "K" in Klock. However, I'll promise not to from now on. The clock was part of Great All American Road Show, a tour of Route 66 and environs by the California Clock Company which makes the animated clocks. The tour started June 21 at the company's factory in Santa Monica, California, and is scheduled to run through September 3. Santa Monica holds the western terminus of Route 66; "Being a 66 company, we wanted to do something with 66", said Young. The tour's published schedule does make a few deviations from the route, like Branson, MO, and Eureka Springs, AR, but sticks pretty much to the Mother Road. 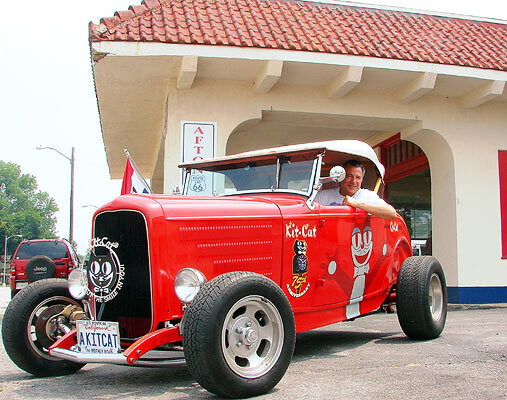 Company President Woody Young drives the tour's signature vehicle, a rebuilt 1932 Ford deuce coup roadster, through the portico of Laurel Richards Kane's renovated 1930's Afton Station in Afton Oklahoma on Route 66 this past Thursday. Afton Station is quite an impressive project, and will be the subject of a later post. 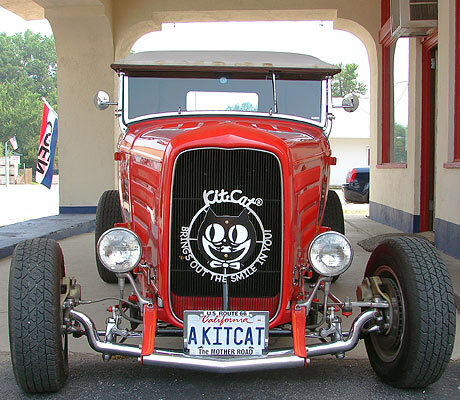 Young says he chose the roadster as the tour's show vehicle because, like the Kit-Cat clock, it is 75 years old. The 75th anniversary of the clock was the catalyst for the tour, which, not coincidentally, is scheduled to last 75 days. The last time I saw this model of car, it truly was only a model in the California Route 66 Museum. When I asked Young for a brief interview, he didn't have trouble finding something to say about Route 66: "We've been promoting Route 66 and all the fantastic things along the route - the interesting things and the nice people that make the route enjoyable...to go to each city, and see the city, or town or community in its fullness. 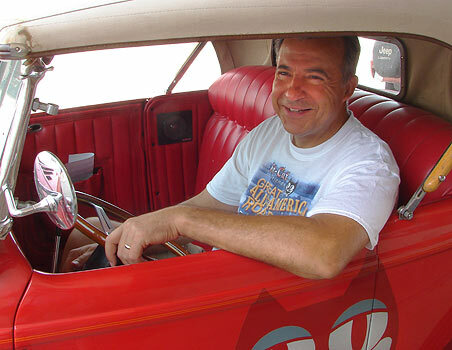 In other words, we didn't just want to just drive real quick through the town and say, Ahh!, there's a nice little icon..."
You can cruise the main drag of Afton in less than a minute without breaking the speed limit. 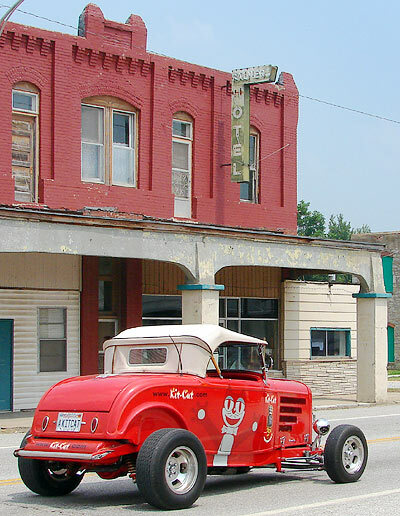 Here, the car passes the long-gone Palmer Hotel. "...No, we stopped and we took pictures and we looked the town over and we looked at as many different places to go as possible and we've been doing that each step of the way and trying to take in every museum along the way as well as every special gasoline station or cafe that makes it really unique, and of course all the car displays as well." "We've really enjoyed it. this has been just a fantastic time and I'd recommend it to anybody who'd like to really do something adventurous. This was the route to take. They will find so many unique individual things to do; in other words, what you do in California is different in Arizona, is different in New Mexico, is different from Texas. It's different when you get Oklahoma, different when you get to Kansas and Missouri and Illinois. They're all on the same route but they're all different." 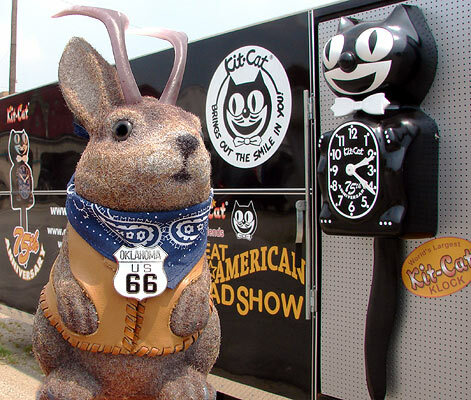 Young fondly recalled a college spring break trip in 1962 when he and some friends drove Route 66 from St Louis to Santa Monica as well as a lawn mower race he saw just this past week in El Reno Oklahoma. Friday the tour stopped in Webb City Missouri, again on Route 66. Young helps Ace sit on the cat's shoulder. Ace wears red in honor of Webb City where the color predominates because of civic pride in its high school mascot, the Cardinal. Local Kit-Cat enthusiast Kathy Sizenstricker had Young autograph the back of her yellow Kit-Cat clock. It's an electric model, as opposed to battery-operated which means it dates at least as far back as 1990. She bought it 5 years ago at an auction and had a new motor installed so she could use it on her office wall. You know all the debates about what we'd pay for stuff if so much manufacturing wasn't outsourced to foreign countries? Well, these kitties ain't cheap: A new Kit-Cat clock will set you back 35 to 70 bucks, depending on size and decoration. The standard model is $40 and there's a Route 66 edition at $50. However, Young says that they are entirely American-made. 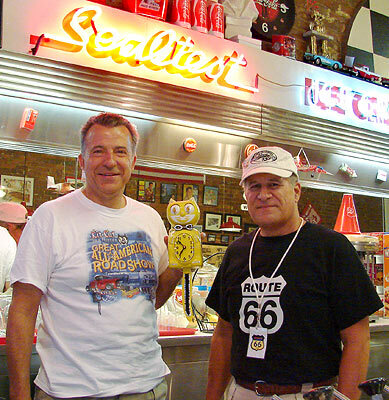 Woody, holding Kathy's Kit-Cat clock, poses with Rod Harsh of nearby Carterville's Route 66 Visitor's Welcome Center and Gift Shop Friday night at Webb City's Bradbury-Bishop Deli on Route 66. The visitor's center and the deli will likely be subjects of future posts. Speaking of the future, I asked Young if sales of the clock spiked when it appeared in motion pictures or on TV. He said that it certainly did, and pointed out a big sales increase coinciding with a scene in Back to the Future when a Kit-Cat clock was prominent. Kit-Cat clocks have been in the news a bit this year. 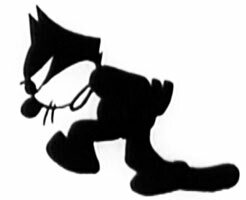 Felix the Cat Productions, the current owner of silent film era cartoon icon Felix the cat, has brought a lawsuit against Woody's California Clock Company for infringing on its copyright of the black and white cat. I find oddities on both sides of this conflict. 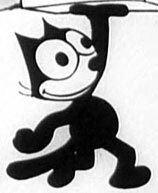 The Felix people waited 75 years to decide to bring legal action, and the Kit-Cat folks tempted fate by briefly calling their product a "Felix clock" right before the lawsuit was filed. As to the outcome, Young was confident as he lounged on a soda fountain stool at Bradbury-Bishop Deli on Friday: "they'll get nothing from this...they have nothing to put a hat on." 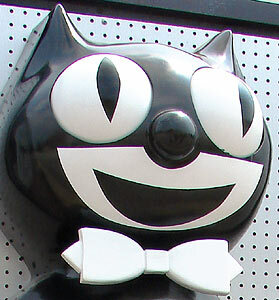 And what does the world's largest Kit-cat clock look and sound like in motion? Here ya go! The clock is fiberglass and was built by California Clocks' graphics guy, Dennis McLain, who is on the tour along with Dave Yoder. 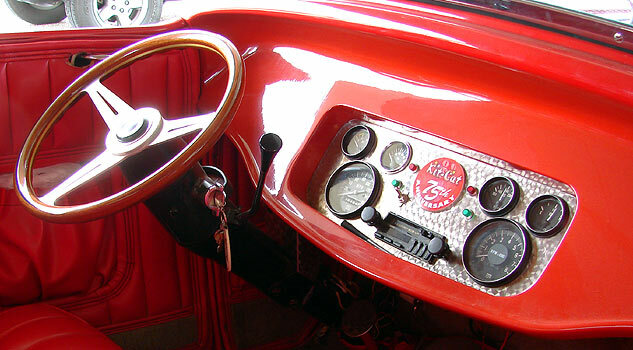 The clock is mounted on a swing-out panel in the trailer that carries the roadster when not in use. Young says he'll likely donate the clock to the Smithsonian Institution. And just in case your real cat likes videos of things moving, here's a tail for you. I do so love good ole' American kitsch. Now, if I can just photograph the world's largest lava lamp, that used to be in Times Square. Update: Speaking of big cool stuff in Times Square, Woody Young told me tonight at a car gathering that the Yellow Tail wine company of Australia plans to exhibit an even larger Kit-Cat clock as an advertisement in Times Square in NYC, starting in October. Young says the clock will be nine feet tall and will have a yellow tail. Looking at the Yellow Tail website (actually, the company prints it "[yellow tail]"), I wonder if they aren't going to sculpt a variant that's based on the yellow-footed rock wallaby, an animal they say roams their vineyards. Young also said that in addition to the one in NYC, there will be three other Yellow Tail Kit-Cat clocks used as public advertisements in LA, Chicago and San Francisco. Those are the terminal cities for Route 66 and the Lincoln Highway...sounds like additional road trip perkage to me. i wuz reedin yer blog wid intrest. do u ever get to da grate state uv noo york? it'z me again ... jh. thank u fer vizitin mi blog. wen u talked abowt havin da "bipedz" under control ... i know u wer referrin to mi brudder mickey. so wuddya think? lemme know. an, if yer ever in noo york ... look me up!